For the woman the film is based on, see Neerja Bhanot. Neerja is a 2016 Indian Hindi-language biographical thriller film directed by Ram Madhvani and written by Saiwyn Quadras and Sanyuktha Chawla Shaikh. It was produced by Atul Kasbekar's company, Bling Unplugged, alongside Fox Star Studios. The film features Sonam Kapoor as the title character, with Shabana Azmi, Yogendra Tiku and Shekhar Ravjiani in supporting roles. The plot centres on the Libyan-backed Abu Nidal Organization's hijacking of Pan Am Flight 73 in Karachi, Pakistan, on 5 September 1986. The film is shown from the point of view of the flight's head purser, Neerja Bhanot, who thwarted the hijack attempt by alerting the pilots, thus grounding the plane; Bhanot died trying to help save 359 of the 379 passengers and crew on board. Development began in September 2014, when Kasbekar signed Madhvani and Kapoor for a film to be made by Bling Unplugged and Fox Star Studios. Saiwyn Quadras and Sanyuktha Chawla worked on the script, with principal photography taking place in Mumbai. The film features music by Vishal Khurana, with lyrics written by Prasoon Joshi. 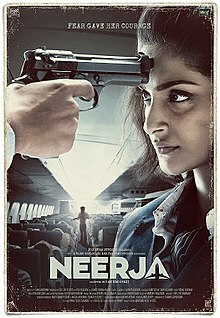 Neerja was released on 19 February 2016 to positive critical reception, with praise directed to Kapoor's performance, and became one of the highest-grossing Bollywood films featuring a female protagonist. The film received a number of accolades at Bollywood award organisations, with particular praise for Kapoor's performance and Madhvani's direction. It won two awards at the 64th National Film Awards including Best Feature Film in Hindi and Special Mention for Kapoor. At the 62nd Filmfare Awards, Neerja won six awards, including Best Film (Critics), Best Actress (Critics) (Kapoor), and Best Supporting Actress (Azmi). The film opens with 22-year-old Neerja Bhanot (Sonam Kapoor) arriving late for a house party. Later that evening, her mother Rama Bhanot (Shabana Azmi) expresses concern about Neerja's job as a flight attendant, suggesting that Neerja should return to her old modelling career. Neerja insists on keeping her job. She is driven to the airport by her boyfriend Jaideep (Shekhar Ravjiani). During the flight, Neerja reflects on her brief, unhappy arranged marriage to Naresh (Kavi Shastri), a professional in Doha, Qatar, who abused her over her small dowry and inability to perform household work. She eventually returned home for a modelling contract. Naresh sent her parents a letter complaining about the dowry and their daughter's lack of domestic skills, demanding that Neerja either bring back money or not return at all. Neerja left Naresh and landed a job with Pan Am Airways. As Neerja boards Pan Am 73, it is meanwhile revealed that the Abu Nidal organisation, a Libyan-sponsored Palestinian terrorist group, plans to hijack the plane in Karachi. The plane takes off from Mumbai's Sahar International Airport and lands in Karachi, where the four Abu Nidal terrorists, disguised as security officers escorting a Libyan diplomat, hijack the plane. Neerja quickly alerts the cockpit, without the terrorists knowing, and the three American pilots escape through the overhead hatch, fleeing to the terminal under fire from the hijackers. The American pilots had just enough time to escape, as the hijackers did not realise that the cockpit of a Boeing 747 is located upstairs. When an Indian American passenger reveals himself as an American, one of the terrorists murders him and throws his body off the aircraft in front of the Pakistani negotiators. The terrorists try to locate a radio engineer among the passengers by ordering Neerja to make an announcement over the intercom. When Imran Ali (Shashi Bhushan), a Pakistani radio engineer, begins to stand up, Neerja signals for him to sit down. The terrorists have the flight attendants collect all passports to identify the American passengers and hold them hostage; Neerja and her colleagues collect the passports, disposing of any American passports by throwing them down trash chutes or hiding them under seats. Dejected over not finding any American passports, the hijackers locate a British passenger and hold him hostage. The Pakistani negotiators inadvertently reveal the name of radio engineer Ali, whom the hijackers bring to the cockpit to use the radio for negotiations. Meanwhile, the Pakistani authorities try to stall for time. When a younger terrorist assaults the passengers and molests the attendants, the terrorist leader chastises him; humiliated, the younger terrorist storms into the cockpit and shoots Ali, screaming wild threats over the radio. While negotiations with the Pakistani air controllers drag on, the negotiators slowly lose control of the situation, with the hijackers becoming more agitated by the minute. Around 17 hours later, the plane loses auxiliary power, and the lights go out inside the plane. Despite Neerja and the other attendants' attempts to explain, the terrorists assume the Pakistanis cut the power deliberately, and anticipate an imminent Pakistani raid on the plane. The panicking hijackers begin shooting down passengers indiscriminately; at great peril to her own life, Neerja opens the emergency exit door and deploys the chute, directing passengers out of the plane. Choosing to let the passengers escape first, Neerja is shot by a terrorist as she tries to shield three young children from the gunfire. The children escape the plane and Neerja then drags herself out of the doorway and down the emergency slide before dying. The film ends with a tribute to Neerja, who was eventually honoured posthumously with the Ashoka Chakra, India's highest military decoration awarded for peacetime valor, courageous action or self-sacrifice. Sonam Kapoor as Neerja Bhanot. In an interview with IBT, Kapoor describes her character and explains, "Neerja is an extremely principled girl with the most amazing characteristics. She had the presence of mind, the compassion, and the kindness to take care of other people and not herself." Pre-production work on Neerja began in September 2014, when the film's executive producer Atul Kasbekar said that his company, Bling Unplugged, would co-produce Ram Madhvani's film along with Fox Star Studios. Kasbekar later tweeted, "Do U Know Who Neerja Bhanot Is? No? Well U Really Really Should...". He said, "For us [...], a story of courage as exceptional as Neerja's simply deserved to be told. We just decided that we would our bit to ensure that India would remember one of its great heroines." The film's script and screenplay were penned by Saiwyn Quadras, and the dialogue was written by Sanyuktha Chawla Sheikh. The director of photography for the film was the cinematographer Mitesh Mirchandani, who had been previously associated with 2012 film Luv Shuv Tey Chicken Khurana. The editing for the film was done by Monisha R Baldawa and Manohar Verma served as the stunt director for the film. Kapoor was contracted by Kasbekar to play Neerja Bhanot, the senior flight crew member. On receiving the role of Neerja in the film, Kapoor told PTI, "I thought doing this film just reaffirms that it is about not bowing down. It is an inspiring story for me to do. I am blessed." It was reported in May 2015 that Shekhar Ravjiani, one half of Bollywood's performing/producing duo Vishal–Shekhar, would play a short role in the movie, marking his acting debut. Shabana Azmi played the role of Neerja's mother in the film. In an interview with The Indian Express, Azmi describes her character and explains, "It was very difficult to play her, particularly the last scene where Rama addresses an audience. It is an extremely well-written emotional scene, which does complete justice to the moment." "So Ram you're making this film Neerja, do you realize the responsibility that you have? You're actually going to be building a set, you're not even using a real plane and then you're going to get people as passengers. Do you realize what actually happened on that plane [...]?" Principal photography of the film commenced 19 April 2015 in Mumbai. After two months of filming, the shooting was wrapped up on 19 June 2015. Kasbekar tweeted, "Amazing! And it's a wrap on Neerja !!! 32 shooting days!!! That's Two More days than Birdman took!" During the principal photography of the film, many Bollywood celebrities visited the film's sets, including Vidya Balan, Boman Irani, Anil Kapoor, and Raju Hirani. "I knew that getting Aamir Khan, Boman Irani, Vidya Balan, Raju Hirani and Anil Kapoor to speak to the 220 cast would help instill dedication and effort that this film would require," director Madhvani said in a statement. The makers of the film acknowledged the responsibility of portraying the story. One challenge faced was acquiring a real plane for shooting; director Ram Madhvani and Rucha Pathak decided to re-create the plane because a major part of the film required shooting against the plane back-drop. It took them 48 days to build the plane, which closely resembled the original one. The film's visual effects (VFX) were by Tata Elxsi. VCL[a] produced a wide range of visual effects, including the creation of Karachi airport and buildings, and also helped in creating the 1986 period restoration for various locations. Huseini Barodawala, the head of Tata Elxsi, said that "It has been our constant endeavor to leverage our VFX expertise to transform the director's vision onto the big screen and offer larger-than-life experiences to all our viewers." Music rights were acquired by T-Series; the film's music was composed by Vishal Khurana, with lyrics by Prasoon Joshi. The first song from the film, titled "Jeete Hain Chal," was released on 26 January 2016. All music composed by Vishal Khurana. The soundtrack received a positive critical response. Mohar Basu of The Times of India gave the music a 3.5 out of 5 rating, saying that it "is beautiful, pensive, touching and all of it sans melodrama," and that it "is straight from the soul." Joginder Tuteja of Bollywood Hungama said that "the songs of the film heard are strictly functional and won't really be into play once the film is through." He added that the songs "Aankhein Milayenge Darr Se" and "Gehra Ishq" would make the most impression. A critic of The Quint praised the music album and said, "The brilliance of this album is that it features songs which will not hijack and/or disrupt the flow of the narrative. The sound is delicate, fearless, vulnerable and always intimate." The film had a special screening on 16 February 2016 in Mumbai, which was attended by celebrities, including filmmaker Karan Johar; Subhash Ghai; Kapoor's father, Anil Kapoor; Sachin Tendulkar; Yuvraj Singh; Sunil Gavaskar; Ayushmann Khurrana; and Amit Sadh. The film received a positive response from many Bollywood celebrities, with Tendulkar calling Neerja Bhanot a "Braveheart" and saying that "the people should definitely watch the film." The film was released worldwide, in approximately 671 theatres, on 19 February 2016. Upon release, Neerja received positive reviews, with praise directed to Kapoor's performance, and was a moderate box office success. The film was also praised by Delhi's Chief Minister, Arvind Kejriwal, who tweeted that the film's message was, "Live for others, die for others." The film emerged as one of the highest-grossing Bollywood films featuring a female protagonist. Neerja was banned in Pakistan since the film shows Pakistan in a negative light. The Central Board of Film Certification (CBFC) maintained that the film should not be considered "banned" in Pakistan because it was not submitted to them. The film was declared tax-free by Government of Maharashtra and the Government of Madhya Pradesh. The Finance Minister, Jayant Kumar Malaiya, said, "The movies Neerja and Jai Gangaajal will be free from entertainment tax in Madhya Pradesh on account of International Women's Day which was celebrated yesterday." Producer Kasbekar, replied on Twitter, "Big thank you to MP Poonam Mahajan and the Hon CM Devendra Fadnavis in declaring Neerja tax free in Maharashtra. Quick and decisive decision." On its first day, the film earned about ₹47 million (US$650,000) net, much of it from Mumbai, Delhi NCR. It collected ₹76 million (US$1.1 million) net on Saturday and ₹97.1 million (US$1.4 million) on Sunday, with a weekend total of ₹210 million (US$2.9 million). On Monday, the film netted around ₹37 million (US$510,000), with only around a 20% drop in revenue compared to first day. On Tuesday, the film earned around ₹34.1 million (US$470,000). The film's Wednesday, Thursday and Friday earnings were ₹31.4 million (US$440,000), ₹36 million (US$500,000), and ₹31.5 million (US$440,000), respectively. On Saturday and Sunday, Neerja had a massive jump and earned ₹50 million (US$700,000) and ₹66.5 million (US$930,000) respectively, for a total collection of ₹501 million (US$7.0 million) at the box office. On the 11th day (Monday), Neerja collected ₹21.2 million (US$290,000); ₹19 million (US$260,000) on Tuesday; ₹18.5 million (US$260,000) on Wednesday; and ₹17.6 million (US$240,000) on Thursday. By the end of its 38-day run, the film had grossed an estimated ₹1.08 billion (US$15 million) domestically and ₹259 million (US$3.6 million) internationally, for an approximate worldwide total of ₹1.35 billion (US$19 million). Neerja opened strong, collecting ₹1.56 million (US$22,000) in foreign theatres. The film had the highest opening weekend for a female-led film in the US and Middle East; in the UK, it had the second-highest opening weekend of 2016. Upon release, the film, as well as Kapoor's performance, received praise from film critics around the world. Shubha Shetty-Saha of Mid Day gave the film 4.5 out of 5 stars, calling it "a deeply moving experience", and writing for Kapoor deemed it as "her best performance till date". Meena Iyer of The Times of India gave Neerja 4 out of 5 stars and said, "Neerja raises a toast to the daunting spirit of India's daughters; every one of us must salute Neerja." Bollywood Hungama gave the film 4 out of 5 stars and said, "As a movie watching experience, Neerja is flawless. There's not a single false note." Writing for Hindustan Times, Anupama Chopra awarded 4 out of 5 stars, saying that "Neerja is a truly inspiring story that will grip you from the first frame till the last." Sarita Tanwar from Daily News and Analysis gave 4 out of 5 stars, writing, "Neerja is quite easily the finest film in recent times (on par with Talvar) based on a true story." Raja Sen from Rediff.com gave 4 out of 5 stars as well and called it "an absolute must-watch," adding that "Sonam Kapoor is exceptional as Neerja Bhanot." Suahni Singh of India Today rated the film as a 3.5 stars and stated, "Sonam Kapoor delivered her career-best performance as she assuredly plays an abused wife, a beloved daughter and a flight attendant caught in her worst nightmare." Rummana of Yahoo! gave it 4 out of 5 stars, stating, "Neerja deserves loud applause because not only is it an exceptional story of courage but because it is an ode to the undying spirit of humanity" and called Kapoor as "the star of the film". The Economic Times also gave a 4 out of 5 star rating: "Neerja is a must-see, not just for its cinematic value, but also as a reminder to salute Neerja's spirit." Rajeev Masand of CNN-News18 gave a 3.5 out of 5 rating and said, "Neerja is "a well-intentioned, heartfelt film that pays tribute to a real hero." Shubhra Gupta of The Indian Express also gave the film 3 stars out of 5, writing that "Minus the songs and the excessive schmaltz, Neerja could have been outstanding. But still, the film holds, and hold us with it." On review aggregator Rotten Tomatoes, the film holds an approval rating of 100%, based on 9 reviews with an average rating of 8/10. Manjusha Radhakrishnan of Gulf News rated the film 4 out of 5 stars; while she criticised the terrorists' lack of depth and weak points in Neerja's second half, she wrote that "the climax of the film is powerful and makes up for that blip." Jason Klein of Variety declared that DAR-Film Leaderboard was notably absent of Oscar-nominated films, but part of the gap was filled by Neerja. Sonali Kokra of The National praised the film: "Neerja is a great story told well. Mitesh Mirchandani’s jerky camerawork does a great job of using the claustrophobic confines of the aircraft to showcase the oppressiveness of the situation and the terror of the hostages." Wikimedia Commons has media related to Neerja. ^ The full name of VCL is Visual Computing Labs. ^ "Neerja (15)". British Board of Film Classification. Archived from the original on 16 March 2017. Retrieved 15 January 2017. ^ "Neerja flies at box office". Daily News and Analysis. 21 February 2016. Archived from the original on 20 August 2016. Retrieved 9 June 2016. ^ a b c "Box Office: Worldwide collections of Neerja". Bollywood Hungama. 20 February 2016. Archived from the original on 14 March 2016. Retrieved 17 August 2017. ^ "Interview: Neerja is someone I aspire to be like, says actress Sonam Kapoor". International Business Times. 16 February 2016. Archived from the original on 5 August 2016. Retrieved 13 June 2016. ^ "Prashantt Guptha's career takes off". The Times of India. 28 January 2017. Archived from the original on 3 February 2017. Retrieved 11 January 2018. ^ a b "Neerja: Cast & Crew". Bollywood Hungama. 2015. Archived from the original on 11 April 2017. Retrieved 24 June 2016. ^ "Atul Kasbekar to produce Neerja Bhanot biopic starring Sonam Kapoor". India Today. 30 March 2015. Archived from the original on 10 August 2016. Retrieved 29 May 2016. ^ "First Look : Super Star Sonam Kapoor As Neerja Bhanot in the Biopic". Koimoi. 4 May 2015. Archived from the original on 7 May 2015. Retrieved 22 May 2015. ^ "Heartfelt message by writer of 'Mary Kom' after 62nd National Film Awards". Deccan Chronicle. 25 March 2015. Archived from the original on 12 February 2016. Retrieved 14 February 2016. ^ "Neerja review: A story well worth telling, this is Sonam Kapoor's best performance to date". Firstpost. 22 February 2016. Archived from the original on 20 February 2016. Retrieved 24 June 2016. ^ "Sonam Kapoor: Feel Blessed to Play Neerja Bhanot in Biopic". NDTV. 22 September 2015. Archived from the original on 23 January 2016. Retrieved 29 May 2016. ^ "Shekhar Ravjiani to play Neerja Bhanot's lover". The Times of India. Archived from the original on 22 May 2015. ^ "Shekhar Ravjiani to make acting debut in Neerja". Bollywood Hungama. Archived from the original on 22 December 2015. ^ "It was very difficult to play Neerja's mother: Shabana Azmi". The Indian Express. 5 February 2016. Archived from the original on 10 May 2016. Retrieved 13 June 2016. ^ Chopra, Neeti (5 February 2016). "WATCH: How The Crew Of 'Neerja' Actually Rebuilt Pan Am Flight 73". The Huffington Post. Archived from the original on 13 February 2016. ^ "Sonam Kapoor Begins Filming Neerja Bhanot Biopic, Bollywood Stars Tweet Good Wishes". NDTV. Archived from the original on 22 December 2015. ^ "Sonam Kapoor Wraps Up Neerja Bhanot Shoot!". Yahoo!. 20 June 2015. Retrieved 29 May 2016. ^ "Neerja Bhanot biopic: A surprise visitor for Sonam Kapoor". India Today. 25 May 2015. Archived from the original on 6 August 2016. Retrieved 29 May 2016. ^ "WATCH: How The Crew Of 'Neerja' Built An Actual Plane". The Huffington Post. Archived from the original on 13 February 2016. Retrieved 15 February 2016. ^ "Visual Computing Labs, Tata Elxsi: Creates Magic for 'Neerja'". Tata Elxsi. 14 March 2016. Archived from the original on 18 May 2016. Retrieved 31 May 2016. ^ "Neerja: Sonam Kapoor joins Ram Madhvani, Prasoon Joshi for a song launch". India Today. Archived from the original on 16 May 2016. Retrieved 29 May 2016. ^ Ritika Handoo. "Sonam Kapoor impresses in 'Jeete Hain Chal' track from 'Neerja': Watch now!". Zee News. Archived from the original on 29 January 2016. Retrieved 26 January 2016. ^ "Music Review: Neerja". The Times of India. 19 February 2016. Archived from the original on 25 February 2016. Retrieved 30 May 2016. ^ "Neerja (2016) : Critic Review By Joginder Tuteja". Bollywood Hungama. 15 February 2016. Archived from the original on 20 March 2016. Retrieved 30 May 2016. ^ "Review: The Music of 'Neerja' is Disarmingly Good". The Quint. 10 February 2016. Archived from the original on 10 June 2016. Retrieved 29 May 2016. ^ "Aamir, Hrithik in full force for special screening of 'Neerja' starring Sonam Kapoor". The Indian Express. 17 February 2016. Archived from the original on 24 May 2016. Retrieved 9 June 2016. ^ "Neerja movie review: Sonam Kapoor's gripping performance as Neerja Bhanot leaves Anupama Chopra teary-eyed". India.com. 20 February 2016. Archived from the original on 23 April 2016. Retrieved 29 May 2016. ^ "'Neerja' tweet review: The film makes for a compelling watch; a story that everyone needs to know". CNN-News18. Archived from the original on 20 February 2016. ^ "Neerja quick take: Sonam Kapoor shines through this thrilling ride". Hindustan Times. 19 February 2016. Archived from the original on 19 February 2016. ^ Surabhi Redkar (19 February 2016). "Neerja Review". Koimoi. Archived from the original on 20 February 2016. ^ "Arvind Kejriwal's take on 'Neerja'". Zee News. 18 February 2016. Archived from the original on 25 April 2016. Retrieved 29 May 2016. ^ "Box Office: Worldwide collections of Neerja". Bollywood Hungama. Archived from the original on 14 March 2016. Retrieved 3 June 2016. ^ "Women power: Neerja beats Mary Kom and Queen to become highest grossing heroine-centric film". Daily News and Analysis. 8 March 2016. Archived from the original on 11 March 2016. Retrieved 3 June 2016. ^ "Why Sonam Kapoor's 'Neerja' may have been banned in Pakistan". Emirates 24/7. 29 February 2016. Archived from the original on 7 August 2016. Retrieved 2 June 2016. ^ "'Neerja, 'Jai Gangaajal' go tax-free in Madhya Pradesh". Daily News and Analysis. 9 March 2016. Archived from the original on 11 March 2016. Retrieved 10 March 2016. ^ "Well deserved! Sonam Kapoor's Neerja becomes tax free in Maharashtra". Daily News and Analysis. 24 February 2016. Archived from the original on 28 February 2016. ^ "Neerja box office collections: Sonam Kapoor starrer collects Rs. 50.12 cr". The Indian Express. 29 February 2016. Archived from the original on 22 May 2016. Retrieved 29 May 2016. ^ "Neerja box office collections: Sonam Kapoor starrer collects Rs. 50.12 cr". The Indian Express. 29 February 2016. Archived from the original on 22 May 2016. Retrieved 2 June 2016. ^ "'Neerja' review round-up: Here is what critics have to say about Sonam Kapoor-starrer [VIDEO]". International Business Times. 19 February 2016. Archived from the original on 25 June 2016. Retrieved 2 June 2016. ^ "'Neerja' movie review: Audience impressed with Sonam Kapoor's performance". International Business Times. 20 February 2016. Archived from the original on 25 May 2016. Retrieved 24 June 2016. ^ "Neerja Movie Review". Mid Day. Archived from the original on 20 February 2016. Retrieved 19 February 2016. ^ "Neerja Movie Review". The Times of India. 19 February 2016. Archived from the original on 7 May 2016. Retrieved 31 May 2016. ^ "Neerja review". Bollywood Hungama. Archived from the original on 20 February 2016. Retrieved 20 February 2016. ^ "Neerja review by Anupama Chopra: This one is a genuine weeper". Hindustan Times. Archived from the original on 20 February 2016. Retrieved 20 February 2016. ^ "Neerja Review: A career best portrayal captures a true hero's grit". Daily News and Analysis. Archived from the original on 21 February 2016. Retrieved 20 February 2016. ^ "Review: Neerja is an absolute must-watch". Rediff.com. Archived from the original on 19 February 2016. Retrieved 20 February 2016. ^ "Neerja review: Sonam Kapoor delivers her career-best performance in Ram Madhvani's film". India Today. 19 February 2016. Archived from the original on 2 July 2016. Retrieved 24 June 2016. ^ "Yahoo Movies Review: Neerja". Yahoo!. 19 February 2016. Archived from the original on 21 February 2016. Retrieved 29 May 2016. ^ "'Neerja' review: No theatrics, a must-see film". The Economic Times. 22 February 2016. Archived from the original on 4 May 2016. Retrieved 29 May 2016. ^ "'Neerja' review: A well-intentioned, heartfelt film that pays tribute to a real hero". CNN-News18. 19 February 2016. Archived from the original on 23 May 2016. Retrieved 29 May 2016. ^ "Neerja movie review: Sonam Kapoor makes us believe she is, was, Neerja". The Indian Express. 22 February 2016. Archived from the original on 20 February 2016. Retrieved 29 May 2016. ^ "Neerja (2016)". Rotten Tomatoes. Fandango Media. Retrieved 13 July 2018. ^ "Review: 'Neerja'". Gulf News. 18 February 2016. Archived from the original on 2 June 2016. Retrieved 30 May 2016. ^ "Indian Films 'Fan,' 'Neerja' Build Buzz for U.S. Release". Variety. 23 February 2016. Archived from the original on 30 June 2016. Retrieved 30 May 2016. ^ "Film review: Neerja is an extraordinary tale of sacrifice without theatrics". The National. 20 February 2016. Archived from the original on 4 June 2016. Retrieved 30 May 2016.